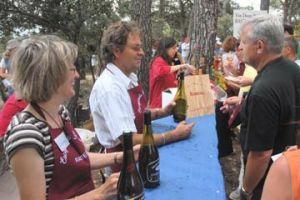 Once a year in the village of Rasteau in the Vaucluse a tasting of wines and fine food takes place combined with a stroll through the vineyards, the Escapade des Gourmets. This is such a pleasant and enjoyable event that tickets sell out months in advance the week they go on sale. Get ready, inscription starts on February 1st. Hotels and bed and breakfast at Rasteau, Vaisons-la-Romaine and Orange. Who said that physical exercise and drinking wine don’t go together? The proof that they do is the Escapade des Gourmets which takes place every year in Rasteau, in Vaucluse, in the heart of the Côtes du Rhône vineyard. A warm and friendly event which will see over 2000 people gather for its 20th edition on the 9th of June. Participants come from the surrounding area and neighbouring departments, but also from everywhere in France as well from England, Ireland, Belgium and Scandinavia. “To keep the atmosphere and the spirit of this epicurean promenade we don’t want too many people”, explains Didier Charavin, winemaker and president of Terres de Lumière, the organizing association. “But we receive more than 5000 requests and all tickets are sold within a week. Then, it’s only possible to get a few through some hotels and bed and breakfasts that keep them for their guests”. It goes without saying that the program is more than attractive. 6 km of trekking through vines, hills and woods with a gastronomic stop every kilometer. On the menu are local dishes and tasting of the village’s wines which are soon due to get their own appellation. An important part of the event’s success is that not everybody leaves at the same time or follows the same path. Walkers leave in groups of 100 every 10 minutes from 10.50 to 13.50. This is to avoid congestion at the tasting points. Groups of friends out enjoying themselves as well as couples, wine lovers or families with kids all take part in this cosmopolitan event. Parents even come carrying children on their backs!!! There is one thing that they all have in common though: a glass hanging around their neck. A piece of equipment more essential than hiking boots as the itinerary is more festive than sporty. Moreover, no needs to wait long for the first pause. Hardly out of the village and it’s already time to taste white wines made from Grenache blanc, clairette and bourboulenc grape varieties while nibbling on amuses bouches. Once this aperitif is out of the way, the route continues through rocky vineyards, whose history and characteristics are detailed on explanatory panels. From time to time there are beautiful view points on the foothills of the Alps and two of Vaucluse’s most famous natural sites, Mont Ventoux and Dentelles de Montmirail. The next stop is hidden in the cooling shade of a pine-grove where “foie gras de canard” is served along with a glass of Rasteau’s own fortified wine. A 21° golden coloured wine with apricot and honey flavours made from grenache grapes to which alcohol is added during fermentation. To be drunk with moderation as immediately afterwards come the only difficult parts of the route. The ascent to the chapel of Saint-Didier which everyone takes at his own pace chatting about this and that with friends or comparing the quality of the wines they’ve just tasted. Nothing really tough, but at the summit it’s nevertheless enjoyable to quench your thirst with a chilly rosé and to eat a puff pastry while listening to the Chorale des Côtes du Rhône render drinking songs. A little further away, it’s also possible to watch actors perform short plays about modern life and wine. From then the path descends slightly towards Rasteau zigzagging between vines and woods and passing through two clearings: one for the main course and one for the cheese. An opportunity to discover the red wines made by the village’s winemakers, Côtes du Rhone Village made from grenache, mourvèdre and syrah grapes. A musical atmosphere accompanies these tastings with bands playing jazz and music hall songs. An invitation to digest and take a rest laid out on the grass. Don’t worry, the exertion is almost over. A few hundred meters more and the first houses of the village appear. Spurred on by the sound of a musical show taking place beside the church and the ruins of the medieval castle, walkers arrive at the end of the final stage where dessert is waiting for them. In this case a chocolate cake, the perfect match for a fortified red wine. A Rasteau speciality. And so concludes this gourmet stroll. Allow at least 4 hours and even better 6 hours or more to have time to taste the wines and enjoy the scenery at a leisurely pace. During the Escapade des Gourmets it’s possible to taste red wines from all of Rasteau’s winemakers as well as a selection of three whites, three rosés, three golden fortified wines and two red fortified wines. This selection and the wines offered change from year to year. Generally speaking the reds are two to three years old and the rosés and whites one year old.